In honor of the upcoming royal wedding, we read Alyssa Cole’s first Reluctant Royals romance, A Princess in Theory, with the 2016 Romance Writers Association librarian of the year, Robin Bradford. 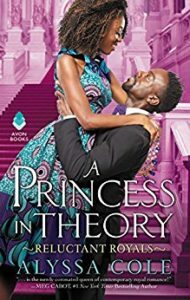 Although this book has a slightly silly premise–namely, what if spam emails insisting that you’re betrothed to the prince of a small African nation were real–we loved it, just as much as Prince Thabiso loves his lost love Naledi. Join us to be reminded that love is real, even if neither Thesolo nor Wakanda are. Candy pairing: Kait says homemade macarons, Renata says King Size Skittles, Robin says a 100 Grand Bar. Coming up next: Wonder by R. J. Palacio.